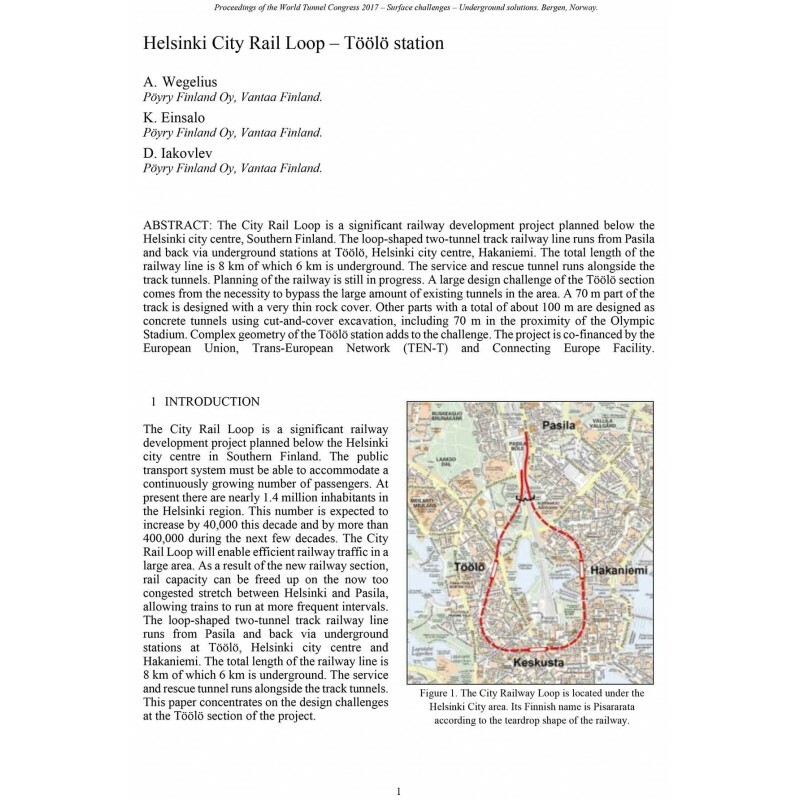 The City Rail Loop is a significant railway development project planned below the Helsinki city centre, Southern Finland. The loop-shaped two-tunnel track railway line runs from Pasila and back via underground stations at Töölö, Helsinki city centre, Hakaniemi. The total length of the railway line is 8 km of which 6 km is underground. The service and rescue tunnel runs alongside the track tunnels. Planning of the railway is still in progress. A large design challenge of the Töölö section comes from the necessity to bypass the large amount of existing tunnels in the area. A 70 m part of the track is designed with a very thin rock cover. Other parts with a total of about 100 m are designed as concretetunnels using cut-and-cover excavation, including 70 m in the proximity of the Olympic Stadium. Complex geometry of the Töölö station adds to the challenge. The project is co-financed by the European Union, Trans-European Network (TEN-T) and Connecting Europe Facility. Abstract: The City Rail Loop is a significant railway development project planned below the Helsinki city centre, Southern Finland. 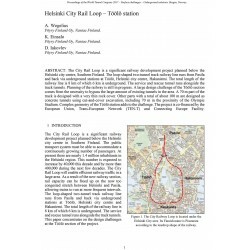 The loop-shaped two-tunnel track railway line runs from Pasila and back via underground stations at Töölö, Helsinki city centre, Hakaniemi. The total length of the railway line is 8 km of which 6 km is underground. The service and rescue tunnel runs alongside the track tunnels. Planning of the railway is still in progress. A large design challenge of the Töölö section comes from the necessity to bypass the large amount of existing tunnels in the area. A 70 m part of the track is designed with a very thin rock cover. Other parts with a total of about 100 m are designed as concretetunnels using cut-and-cover excavation, including 70 m in the proximity of the Olympic Stadium. Complex geometry of the Töölö station adds to the challenge. The project is co-financed by the European Union, Trans-European Network (TEN-T) and Connecting Europe Facility.